The Prepirineo, or pre-Pyrenees, are the ‘foothills’ of the Pyrenees on the southern side of the Spanish border with France. Although little appreciated outside Spain they are a walker's paradise. They combine great scenery, wildlife, historical interest, good local food, a huge choice of accommodation, good weather and a comparatively long walking season. With the help of my Spanish friend Juan Holgado, the expert on Spanish walking, I'm researching the area (an excuse for a series of Spanish holidays) and if it's as good as I think it is I will write a guide. Defining where foothills start and finish is always a challenge and that's as true of the Pyrennees as it is of the Alps. 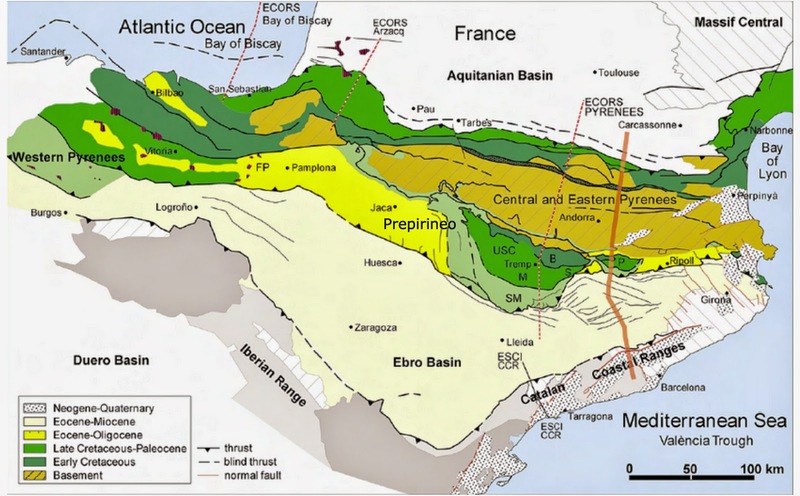 The Prepirineo to an extent are defined by geology. The Pyrennees correspond to an exposed line of particularly old rock (known as the 'axial line' or 'primary axial line') with the Prepirineo formed by younger rock sitting either side of the ancient core. Geologically the Prepirineo are uplifted remnants of rocks that would originally have covered the older rocks in the middle, but being younger and softer they didn't last as long. Of course, with great slabs of rock folding and faulting over each other it's actually more complicated. In particular, it's not symmetrical and there are lots more of the younger, softer rocks on the southern Spanish side of the core than on the northern side. The old tougher rocks in the middle form the highest peaks with many mountains well over 3,000m. Although there are plenty of peaks in the Prepirineo higher than 2,000m the mountains are generally smaller. From the walker's perspective, this matters a lot. In particular, it means a much longer Prepirineo walking season than the Pyrenees or the Alps. In the Alps, Europe's main 'walking playground' where walking infrastructure is the best in the world, the 'season' only really starts in July and is over by the 3rd week in September. In the Prepirineo the season is more than twice as long, starting in May or even sooner and going through to the end of October. The geology has a distinct impact on the scenery. Although the mountains aren’t alpine like the Pyrenees they are, in their own way, just as dramatic and surprisingly varied. 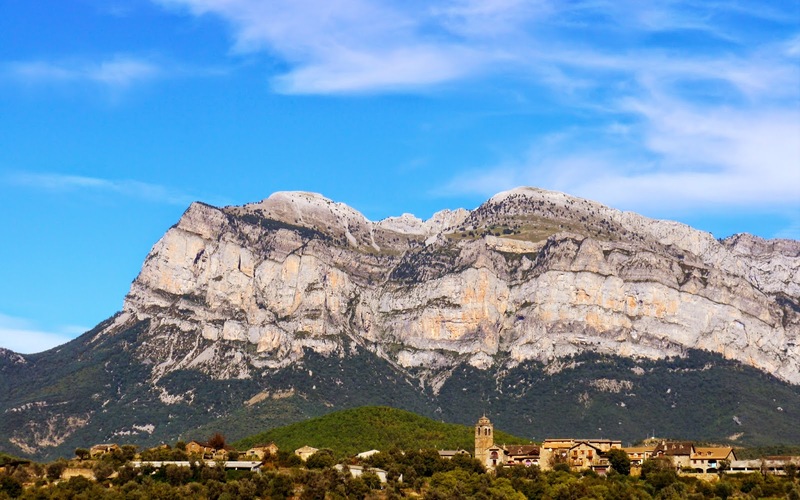 The rock, a mixture of limestone and much younger sedimentary rock washed down from the Pyrenees, has been deeply eroded by rivers rushing down from the north producing a landscape of deep gorges and huge multi-coloured cliffs. Geology and geography have had an impact on the history. For several hundred years the Prepirineo was the buffer zone between a Christian world to the north and a Muslim world to south. Squeezed into tight valleys on the southern of the Pyrenees and organised, like the Welsh Marches, into a series of small virtually autonomous states, Christian communities not only survived but produced a distinct architectural legacy including some of the earliest and best Romanesque churches and castles in Europe. The names of these mini-states, which eventually developed into the much larger kingdoms of Navarre and Aragon, survive today in the form of ‘comarques’ (e.g Sobrarbe, Ribagorza, Urgell) – smaller but similar to counties in the UK – in both Catalonia and Aragon. Of course, walking in the Prepirineo comes with all the joys (and some of the frustrations) of walking in Spain. For the uninitiated these include; good and fairly predictable weather; wonderful and perfectly graded ancient footpaths used until recently as the main communictions routes for local people; rich wildlife, particularly birds and vultures; remote and surprisingly empty countryside; and, important for a softy like me, a great choice of accommodation providing authentic food and good value for money. 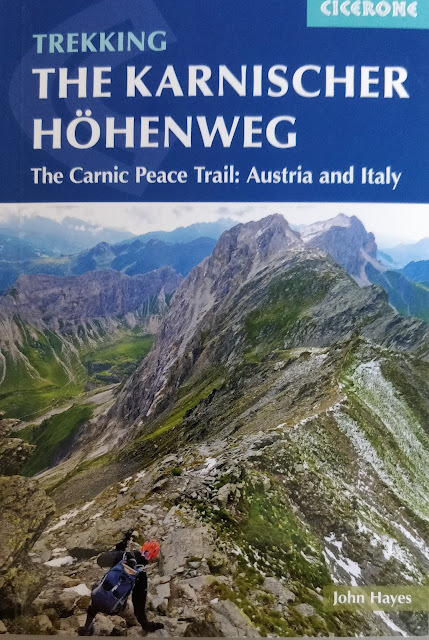 My first Cicerone guide ( the Spannish GR1)is currently in production an I've started on the second (Munich to Venice): ‘Walking the Prepirineo’ could be my third. 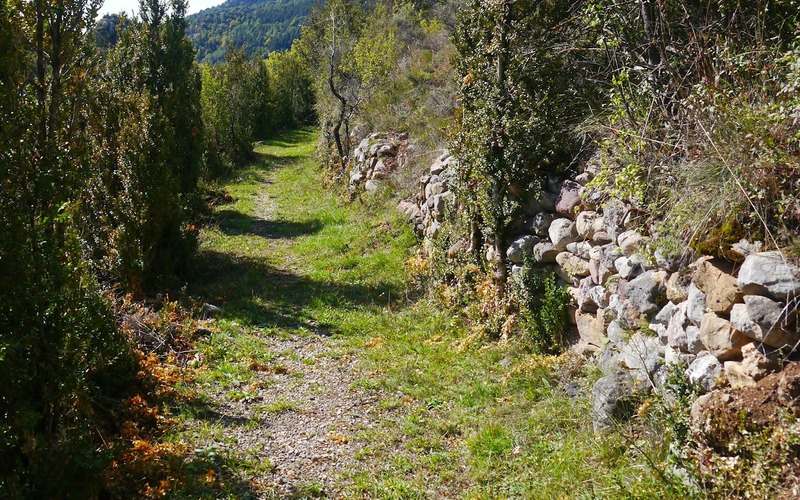 But researching this project is a different game to researching an existing trail like the GR1. The Prepirineo is not really defined. I have to work out the best places to walk from and then, for each place, the best walks have to be found. It has to make sense for a potential walker who wants to experience the Prepirineo in a typical one or two week holiday. Fortunately I can ‘ask a friend’, a Spanish friend, my mentor on all things associated with walking in Spain Juan Holgado. Juan, whom I providentially met three days into my E4 trip from Tarifa to Budapest, is a real expert on Spanish walking and maintains a website packed with information about long distance trails in Spain. After finishing the E4 and having acquired a taste for Spain, Juan has helped me plan subsequent trips (including the GR1) but his help on the Prepirineo has been particularly important. I’ve just come back from my first reccie when I spent a fortnight exploring the Vall de Boí, the Valle de Benasque and the area around Ainsa. I must say I'm really encouraged. 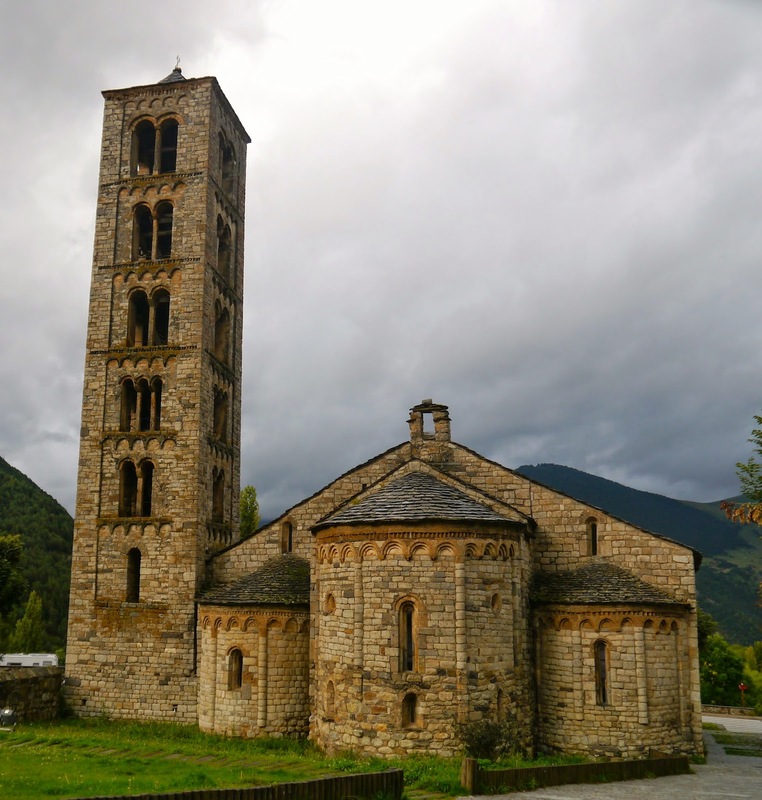 The Vall de Boí, where the wonderful Romanesque churches have been given UNESCO World Heritage Site status, was particularly good and there is enough great walking for a week's holiday. I was impressed throughout by how well everything is "organised" - good local information and clearly marked paths. Although October isn't busy there is a sense of welcome from the locals who like to welcome walkers. 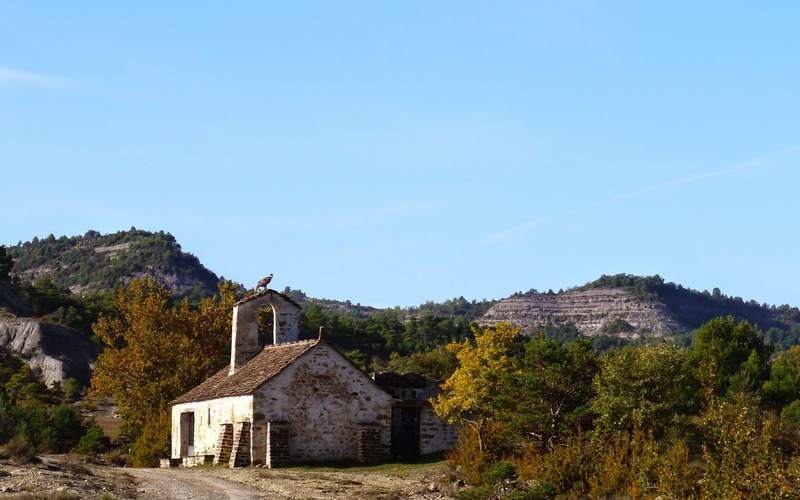 Over the next few weeks I'll publish on the blog the details of the walks I did in October 2014 in the Prepirineo. If you've done any walking in the area, have any ideas for future exploration please get in touch either by leaving a comment on the blog or sending me an email.